With the increasing number of Indian wedding functions, there's always a fear of repeating an outfit way too many times. Plus, buying multiple outfits with a heavy price tag is not the most economical option in the world. Which is why we love the idea of renting wedding dresses! These days, you can rent everything from bridal lehengas, light lehengas and dhoti pants to gorgeous gowns and even saris for just 10–15% of the MRP! While there are plenty of websites you can rent them from, we picked out the best and are giving you the lowdown on each of them. - Will I Get A Good Fit? All wedding outfit rental websites take your measurements to give you a good fit. - Can I Try The Outfit? Trials at home cost extra (between INR 200–500), except for Flyrobe (free trial). - Hygiene: All of them dry-clean and steam press the outfit before delivery. - Payment & Security Deposit: Can be made online, and about half of them offer COD option. All charge security deposits (except Liberent) — typically equal to the rent cost. Now, check out these five wedding outfit rental websites. Flyrobe has the largest collection of wedding outfits for brides and bridesmaids. From heavy traditional lehengas to cold shoulder fusion outfits, you can find it all at Flyrobe. They’re the only website that will take measurements personally (via a visit to your home) at NO extra charge, and will alter happily as long as it’s possible. Best mid-range designers: Divya Reddy, Prathyusha Garimella, Kalki, Masaba Gupta and Ohaila Khan.Lesser-known boutiques from Delhi & Mumbai: Avnni Kapur, Chamee & Palak, Daddy’s Princess by Priyanka Jain, 6Y Collective, Azra, Niyoosh and House of Ombre. A-List Designers: Sabyasachi Mukherjee, Anita Dongre and Shantanu & Nikhil. 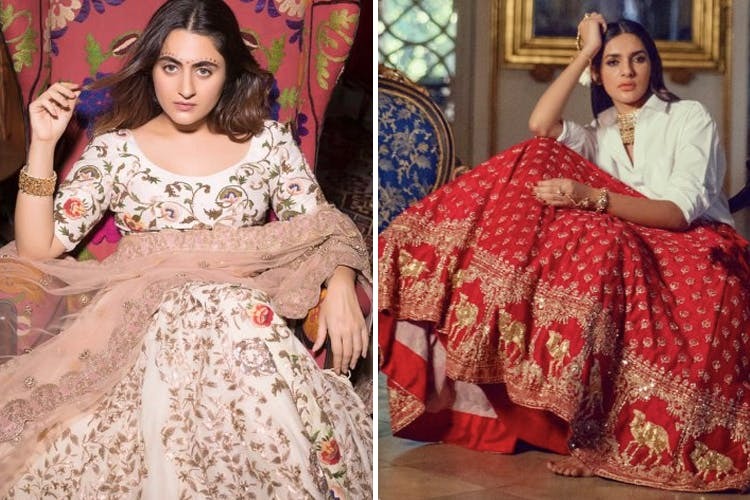 Cost - You can rent a wedding lehenga for as low as INR 5,000, but if you want a Sabyasachi or Anita Dongre lehenga, it will cost you between INR 12,000–30,000. We also found this Masaba Gupta sari for just around INR 2k! Best For: Brides, bridesmaids, wedding guests, sisters and mother of the bride and groom — basically, everyone attending a wedding. Physical Store: Yes! Find their list of stores here. Check out their website here. Delivers To: Delhi/NCR, Bengaluru, Mumbai, Hyderabad, Pune, Kolkata. Rent Period: Four, six or eight days. Send your measurements to them online, or they’ll come to your home to take measurements (at NO extra charge)Custom-fitting available for bridal outfits!If delivered outfit doesn’t fit, they’ll re-alter quickly if possible. Stage3 only rents out designer wear dresses. Fashionable designer wear is available to rent at great prices, for both bridesmaids and brides. Designers Available For Renting: They've got a lot of big names on board like Sabyasachi Mukherjee, Anamika Khanna, Anushree Reddy, Raw Mango , to smaller A-list labels like Prathyusha Garimella, Ridhima Bhasin, Ridhi Mehra, Aastha Narang and Payal Singhal everything here comes with a designer tag. Cost: You can rent a Sabya lehenga for INR 8,000. Best For: All kinds of Indian wedding outfits for brides, bridemaids and wedding guest. Physical Store: Yes, in Hauz Khas Village. You can head there for a free personal styling session and get measured before you rent. Check out their website here. Send measurements online or book a Try On session at Home (only for Delhi residents, who can try 2 outfits at home by paying Rs.200 extra)For Delhi, they will re-alter if you’re not happy with the fit. For other cities, they’ll just refund the amount to you. Rent it Bae has a great number of options from heavy to light wedding outfits (and jewellery + clutches) if you don’t need an A-list designer tag. We particularly love their jewellery pieces. Designers Available For Renting: Better to explore boutiques listed with them such as Violet by Preeti Singhal, Niaj and Ridhi Bansal. Also, they have a limited collection of A-list designers. Best For: Wedding guest outfits (such as this Niaj black gown you can wear to any cocktail wedding function), saris and gowns. Physical Store: In West Delhi only — you can pick seven outfits (in advance) for a trial there. Check out their Facebook page here. Delivers to: Delhi/NCR, Chandigarh, Ludhiana, Jaipur, Mumbai, Pune, Chennai, Hyderabad, Indore, Ahmedabad, Bengaluru. Send your measurements online.For Delhi only — ask for a trial at home (of two outfits) for INR 199 extra. Once outfit is delivered, the delivery person can wait up to 10 mins while you try; return if it doesn’t fit. They’ll send another outfit in two hours, or you get a refund.For other cities — no re-alterations available. The Clothing Rental is a surprisingly good (albeit expensive) find. While Indianwear options are limited, they’re pretty. They stock very nice saris, trendy Indo-western gowns, lehengas and jewellery. Overall, they are one of the few places that stock the latest trends. Online payment only, no COD; delivery charges extra. Other Designers Available For Renting: We only spotted some Payal Singhal pieces, but even those were from a really old collection. The best picks here are in fact, from their in-house label 'TCR'. Cost: It’s definitely on the more expensive side, with non-designer lehengas priced between INR 8–10k, saris INR 3,500–5,000, Indo-western gowns INR 2,500. We found a mint dhoti drape Anarkali for INR 3k. Gowns, for your reception or a white wedding, cost INR 10k. Kundan earrings (INR 1k rent) and jewellery sets (upto INR 3,500) are also worth renting from here. Best For: The bride looking for her reception, cocktail or Christian wedding gown. Look for them under the gowns section, NOT Indo-western gowns. Also good for Indian wedding dresses for bride’s sister (or bestie) and sister-of-the-groom dresses. Physical Store: Yes. Two in Mumbai — Bandra & Versova. Check out their website here. Important to read the descriptions for every outfit, to understand the size available with them.Best to give them a call and understand sizing & discuss alterations. We recommend renting for a wedding from here only if you’re based in Mumbai (you can easily visit the store). For other cities, re-alterations are not possible. This recommendation was first posted on Urbanclap Weddings.